So, I've moved back to the Flock browser to check out the improvements they claim to have made. It's pretty impressive. Among the improvements since last time I used the browser are the My World tab and the People Sidebar (both seen below). My World tracks your recent activity and presents you with the Web Version of the Windows "Recent Programs" list as well as keep you up to date on your favorite feeds and media. 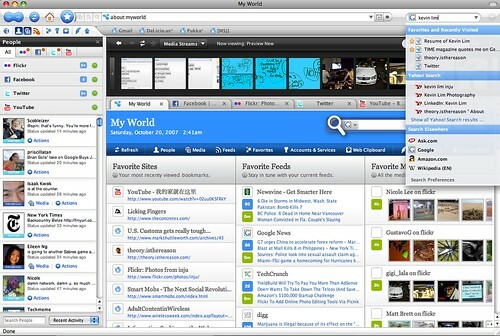 The people tab allows you to track activity on your friends Facebook and Flickr sites. I'm posting this entry from the inline Blog Posting tool and will keep you posted on my findings. A new release is due in February.